The Creative Ad Builder helps you create interesting video extensions based on prepared templates. You can design an unlimited number of ad creatives for free without needing to learn any complicated software. It will only take you a few minutes to get a video extension without the help of a professional designer. 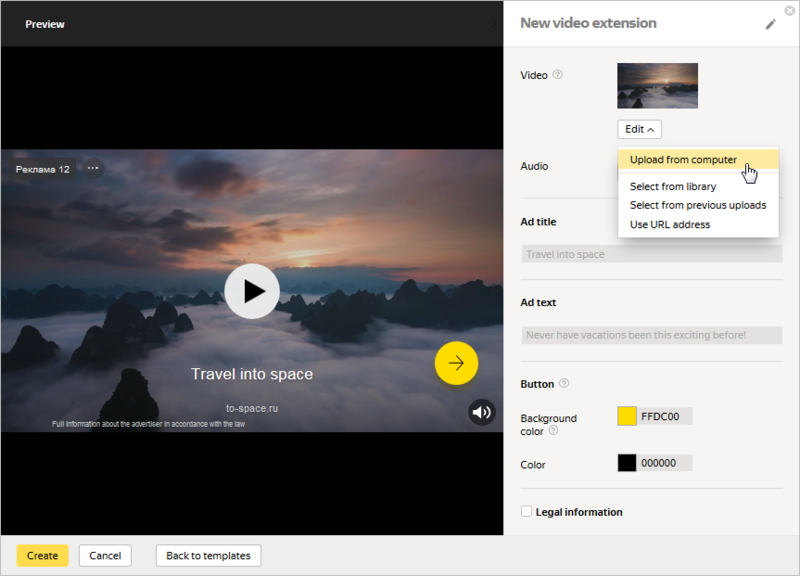 Your ad's title, text, and link will be used in your video extension. You can use your own video clip to create a video extension. You don't need to hire professionals or rent a studio to do this. You can film a clip on your smartphone if it has a good camera, buy a video from a stock database, or make an animation using photos of your products. Pay attention to the requirements for video clip content. To upload a video clip, go to the Ad extensions section in the Ad builder window and click Video → Add → Build from a template. Select a template. If you're using your own videos, we recommended that you use a template with minimal text in the form of subtitles. 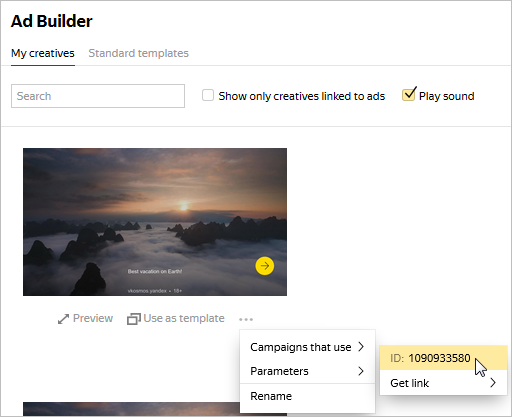 In the Ad builder window, upload your own video clip from your computer or link to it. The audio will be added automatically from the video you upload. Set the color for the text and button. Insert the required information in the Legal information section. All information required by law and the Yandex Ad Serving RulesYandex Ad Serving Rules must be present on the ad creative, including age restrictions and warnings. To add or edit video extensions, go to the Video extensions section and click Video → Add → Build from a template. Choose a template from the Creative Ad Builder window that opens. This will open a window where you can put together your creative. On the right side of the window, select a background video clip and audio from the library. You can view all changes you make instantly in the preview area. You can add only one creative to the ad. On the ad group editing page, go to the Ad extensions section, and click Video → Add → Select from previously added. In the Ad builder window, hold your mouse over the creative, click and select Parameters in the menu.